Archivierter Termin: am 17.02 um 19:00 Uhr. 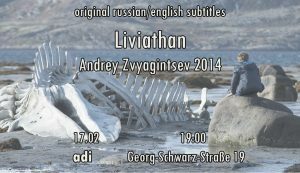 On Sunday, you are invited to watch the film „Leviathan“ directed by Andrey Zvyagintsev as a part of „Russian winter: movie festival“. It’s about to show some films, which deal with more or less contemporary Russian reality and get a view of current status of different parts of everyday and social life and their conflicts. Plot: In a Russian coastal town, Kolya is forced to fight the corrupt mayor when he is told that his house will be demolished. He recruits a lawyer friend to help, but the man’s arrival brings further misfortune for Kolya and his family. Vorheriger BeitragKommentar – Die ELO findet nicht mehr in der ADI statt!Nächster BeitragOffener Workshop: Wie unterrichte ich Deutsch als Fremdsprache (DaF)?